A crew of Apple Pay ambassadors descended on several Chicago neighbourhoods, including Lincoln Park, in advance of the city’s Oct. 7 marathon. “Activation zones’’ for the iPhone maker’s electronic payments service were set up along the route for the race. Spectators using Apple Pay could get US$1 tacos from local food trucks. Four years after introducing Apple Pay, the company is going neighbourhood by neighbourhood trying to get U.S. retailers and consumers to use the service—no easy task. While as many as one in three households with credit cards tap the app at least twice a month in the U.K., the system is used that often by only 14 per cent of those households in the U.S., according to Crone Consulting LLC. And Apple Pay is growing slower here than rival services from the likes of Walmart Inc., according to Crone. But now Apple Pay appears to be gaining customers after years of disappointing fits and starts. Thanks to more installed equipment in stores and a new feature called Apple Pay Cash, the program is making gains in areas from mobile apps to physical stores. While it’s not going to transform the way people purchase goods, analysts say Apple Pay is one more service to keep consumers wedded to the company’s most important product, the iPhone. Rolled out in December, Apple Pay Cash is a peer-to-peer payment feature, like PayPal Holdings Inc.’s better-known Venmo, which lets people send money to each other via iMessage, and it already has millions of users, Apple (AAPL.O) said. The service is driving people to use other Apple Pay features as well. “Over the past year, they’ve made up a lot of ground with the competition by adding peer-to-peer, that was a big missing piece,” Gene Munster, managing partner at Loup Ventures, said in a phone interview. What’s more, Apple Pay’s biggest obstacle—shortage of merchant acceptance of the service—is fading. By year’s end, 60 per cent of U.S. merchants will have the equipment to accept payment via a tap from an iPhone (on par with the U.K. and Canada)—up from 3 per cent four years ago, according to Apple. “The other regions are growing faster because all the merchants already accepted contactless payments and consumers were already using contactless cards,’’ said Richard Crone, chief executive officer of Crone Consulting. Contactless cards are increasingly popular in Europe, and constitute a new competitor for in-store payments. They are often called dual-interface plastic credit and debit cards, which can be tapped to pay at checkout. These cards are rolling out en masse this fall, and could strike consumers as the latest, shiny thing—a cooler, newer technology than Apple Pay, said Tom Poole, senior vice president at Capital One Financial Corp.
Poole said he sees the greatest opportunity for Apple Pay with more acceptance from e-commerce sites. That said, in the U.K., where Apple Pay is having much more success than in the U.S., dual-interface cards have made it easier for consumers to adapt to the idea of tapping their phones at checkouts. Many U.S. stores still report that Apple Pay accounts for a small per centage of transactions. For example, just from 5 per cent to 10 per cent of customers use the service at Pret A Manger on Third Avenue in New York, according to manager Braulio Sanchez, and many only if they’ve forgotten a debit or credit card. “It’s basically the same thing as using a card,” Sanchez said. “If you have the card with you, why not” swipe it, he asked. Apple has been trying to attract users to its service by introducing more capabilities than debit or credit cards. Duke University, the University of Oklahoma and the University of Alabama this month began letting students use the service with their iPhones or Apple Watches as a form of identification to gain access to the library, dorms and events, and to pay for snacks, laundry and dinners around campus. Apple Pay is also used at almost 50 major sports stadiums and arenas. At a recent Los Angeles Football Club soccer match, the service was used for more than half of all transactions, the company said. Apple has also continued to integrate loyalty and transit cards into its digital wallet. Still, Apple’s biggest opportunity in the U.S. may be to slice into PayPal’s digital turf. That’s where shopping is moving: The number of mobile app transactions using Apple Pay is growing much faster than in-store commerce. Apple Pay already is used by hundreds of thousands of websites and in 85 of the top 100 global e-commerce apps. In the U.S., auctions site EBay Inc. is starting to let sellers accept Apple’s service as well. Apple’s advantage lies in that it’s the only digital wallet with payment options for mobile, desktop, in-app, peer-to-peer and physical store payments, Munster said. He estimates that 31 per cent of worldwide iPhone users have used Apple Pay in the past year, compared with 25 per cent a year ago. And adoption of Apple Pay continues to accelerate exponentially overseas with 85 per cent of the users located abroad, he said. 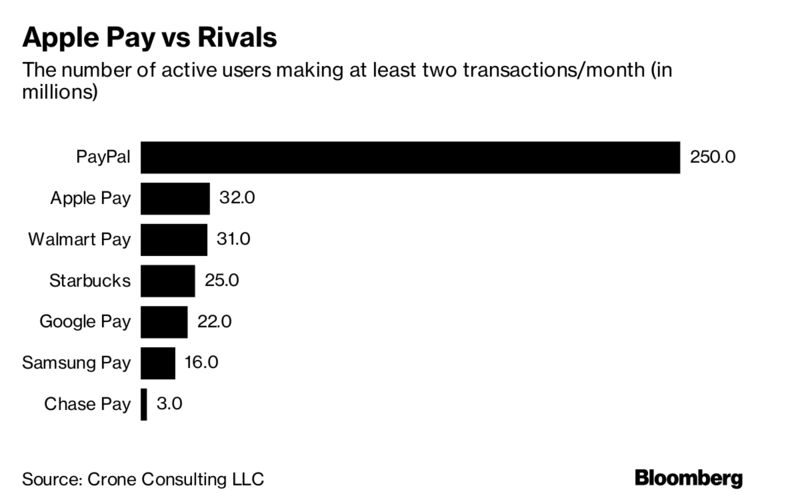 Crone estimates that Apple has 32 million users making at least two transactions a month in the U.S., compared with 250 million for PayPal and 31 million for Walmart Pay. But the comparison with a retailer like Walmart isn’t important to Apple. Walmart’s service can only be used in its stories, while Apple Pay is supposed to eventually work everywhere. What’s more, Apple sees its digital wallet as one more reason consumers want Apple’s gadgets.